When I had my 2016 MKC (not a hybrid vehicle, clearly), I started noticing some quirky things happening after a couple years and soon after the battery croaked (got it replaced under warranty) so I recommend you heed R2D2’s advice. I’m on my second MKZ Hybrid (with an MKC in between). I had a new 2013 MKZ-h for 3 years (lease), then a new 2016 MKC (lease), and, 33 days ago, I went back to the MKZ-h, buying (not leasing) a new 2019 MKZ-h just three days before Christmas. I liked the MKC (the higher driving position, in particular) but I was ready to get back to the Z-hybrid. I had gotten spoiled by the mileage available with the ‘13 Z hybrid I’d had. I just filled up the ‘19 Z-h two days ago, very nearly 4 weeks since my last fill up, and only had to put 10.7 gallons of 87 octane in it. While my driving patterns are likely different from yours, I remember that, with my 2013 Z-h, I could easily go 4 weeks between fillups, and only need 10.5 to maybe 11 gallons to fill up—this for a nice car. That was during moderate weather season (spring and fall), not the heat of summer (requiring lots of A/C here in OK) or the real cold of mid-winter (requiring heater and defroster). During moderate temperature seasons, I often got in the high 30s mpg, and in the really hot or cold of summer and winter, I got more like mid 30s mpg without trying especially hard to get good mileage, I just drove sensibly (in my view). Things to consider: leg and head room in the back seat (it’s not great for tall people) and luggage room in the trunk (the hybrid batteries take up some of the trunk space). The MKZ is a nice car. If the Z you’re considering is in good condition and you’re satisfied with the price (and your family “fits” in the available interior space), I’d definitely say go for it. If you’re a lead-footed driver who likes jack-rabbit sprints away from red lights, you may not get the mileage I did, but if you’re sensible about your driving habits, you may be surprised and pleased with how long you can go between fillups. Good luck!! I wouldn’t chance it. If your Z is on the list, contact your dealership for the fix. I understand your point and if you want to do that, great. I prefer not to have it but that’s just me. Welcome to the forum and to the world of MKZ owners! Welcome! I’m on my 3rd MKZ (2007, 2013 Hybrid, and now a 2019 Z-Hybrid Reserve II that I bought one week ago today). I hope you like it. What color? Mine is Infinite Black Metallic, with “soft orange” pinstripes now (as of Thursday)—it looks sharp! I consider myself a fairly discerning person when it comes to music so I’ve followed these comments pretty closely—especially about the 14-speaker Revel system since that’s what came with the 2019 MKZ Reserve II that I bought last Saturday. I was distressed to hear some strange rattling sound that I couldn’t quite identify coming from the driver door speaker area during the 70-mile drive home from the dealership Saturday evening. Then I realized it was coming from the nearly empty plastic water bottle vibrating in the cupholder in the lower part of the driver’s door. I took the bottle out of that cupholder and the rattling sound stopped immediately. Whew. I’ve spent some time in the car, sitting in the garage and listening to music files saved to a USB thumb drive, all of which were recorded at the highest or next-highest quality settings. This includes a variety of types of music that I think I know really well and thus I know how it “should” sound, ranging from classical (the 4th movement of Beethoven’s Fifth Symphony to the allegro vivacissimo movement of Tchaikovsky’s Violinkonzert) to country star Garth Brooks’s best-selling albums (I especially like the opening seconds of “The Thunder Rolls”) to the opening scene theme music of the original Star Wars soundtrack to George Winston’s “December” and David Lanz’s “Cristofori’s Dream” albums. I've listened at medium-high volume settings (10 to 12) and have fiddled with the fade and balance settings as well as the Audience and On-stage audio settings (usually going with “off” or Audience). I felt it necessary to back off the treble settings somewhat. Overall, I have to agree with MKZMark and say I think the 14-speaker Revel system sounds pretty darn good. Mine is a 2019 model so maybe Lincoln tweaked some things in the current year’s Revel system in comparison to earlier years’ models (or maybe not). Or maybe I just got lucky with a good installation at the factory. Or perhaps my ears are not as discerning as I think they are. However, I have been “into” music for decades as an amateur vocalist and piano player and (in earlier years) as an instrumental musician (violin and trombone) and, so far, I’m pleased with my Z’s Revel system. Ok, just got the pinstripes put on it today. Let me see if I can figure out how to put a picture on here. I realize others’ choice of color may differ from mine but I think it looks good on shiny Infinite Black Metallic paint! Thanks to all for your best wishes and your encouragement and advice. Yes, I have my MKZ by Christmas, as I’d hoped, bbf! (Gee...I wonder what it is with Rhapsody Blue MKZs and dealers not placing orders for them in a timely fashion....) After the pinstripes are on it (and after I figure out how to post photos here), I will put a photo or two here. Thanks again, and Merry Christmas 🎄 and Happy New Year 🎊 to all! 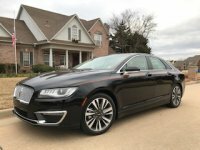 Update: As it looked like it would be February before I would get the 2019 Reserve II MKZ Hybrid that I ordered last October (and was mistakenly NOT actually ordered by the dealership until almost Thanksgiving), I bought an identical (except for exterior and interior colors) 2019 MKZ Hybrid off my Lincoln dealer’s lot today, getting a really good deal as well as excellent financing through LAFS. Darling Wife and I drove it off the lot at 1645 this afternoon. It is in my garage now. It has Infinite Black Metallic paint (first time in my life ever to have a black car!) and a cappuccino interior. The ‘Z I ordered two months ago was Rhapsody Blue with the ebony interior, but everything else on the car I bought today is the same as what I ordered in October. I always shied away from black cars as I thought they would be too difficult to keep clean. However, I figured it would not be appreciably more difficult to keep a black car clean than the dark Rhapsody Blue color, so I decided to give black a try, given that this car was available to put in my garage today (and given that I didn’t know how much longer the really low LAFS interest rates were going to be offered). Besides, I thought, some pinstripes would look really sharp on the metallic black paint that adorns the sculpted lines of the MKZ! The dealership is not holding me to the Rhapsody Blue ‘Z that I’d tried to order in October. They will put it on their lot and sell it when it arrives. So...I turned in my leased 2016 MKC this afternoon (within the three-month “Early Bird” lease termination window) and drove away in a shiny new black 2019 MKZ! Happy, happy. Same here. Just checked mine, too, and it’s location showed as home address (correct). Oh, well, at least that works. While I was at it, I also checked and found that it still shows distance driven in miles, not kilometers. Two for two. Sorry to have to ask...what is LLSOC? Oh. Oops. Sorry. I've not had that specific problem with the Lincoln Way iPhone app but I have had an issue with it doing an unprompted change of the units of measure from miles to kilometers, which is annoying and forces me to go in and change it back to miles. That's happened to me at least twice (I think three times) in the last month and I don't know why. A couple days ago, I was driving my 2016 MKC and got a phone call from my mother and that’s when I noticed that the call was coming through my iPhone only and not through the car via the MKC’s Sync system. I’d been driving a while, about 10 minutes or so, plenty long enough for the car and phone to have synced up by the time the call came in. There was nothing wrong with the iPhone and nothing unusual about the startup of the car that I can recall. Later that same day, upon getting back in the car and starting it, I made a point of noticing whether the video screen on the dash indicated that the phone was connecting (it was). I can’t explain why the connection didn’t occur.